Constructed from 100% recycled board, recycled metal and recyclable polypropylene. 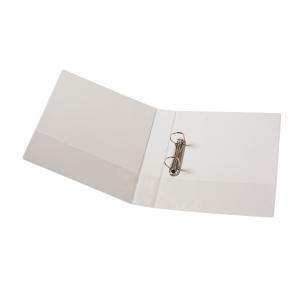 Winc Earth A4 Insert Binder features 2 D-rings, 25mm diameter in capacity that holds up to 200 sheets of office paper. These Insert Binders are the eco-conscious option to your filing solution. Constructed from 100% recycled board, metal and recyclable polypropylene clear overlayed webbed front, back and spine cover insert ideal for presentations, conferences, proposals or reports. Clear pockets are also located on the inner board front and back covers. A4 Binder size measures 262(L) x 42(W) x 315(H)mm. Assorted colours in White, Black, Blue and Red. Select binders with 2, 3 or 4 D-rings. Available ring sizes in 19mm, 25mm, 38mm, 50mm and 65mm diameter. Finding the Right Filing Capacity: Binder capacity is based on the measurement of ring size, not the spine width of a binder. Simply measure the diameter of a ring fitting from the inside top of ring to the inside bottom ring for the right binder to suit your needs. Constructed from 100% recycled board, metal and recyclable polypropylene.